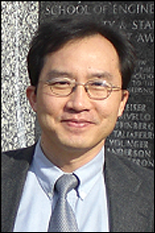 Associate Professor of Aerospace Engineering Kenneth H. Yu received the American Institute of Aeronautics and Astronautics’ (AIAA) Sustained Service Award for dedicated service to the organization. AIAA presented the award at a luncheon on July 16 as part of the 49th AIAA/ASME/SAE/ASEE Joint Propulsion Conference & Exhibit that was held July 15-17 at the San Jose Convention Center, San Jose, Calif. The Sustained Service Award is presented to recognize sustained, significant service and contributions to AIAA by members of the Institute. Up to 20 awards are presented each year to recipients who are members in good standing. These recipients have shown continued dedication to the interests of the Institute by making momentous and lasting contributions over many years. For more information on Professor Yu, visit his profile. For more information on the Sustained Service Award, visit AIAA’s Award webpage.